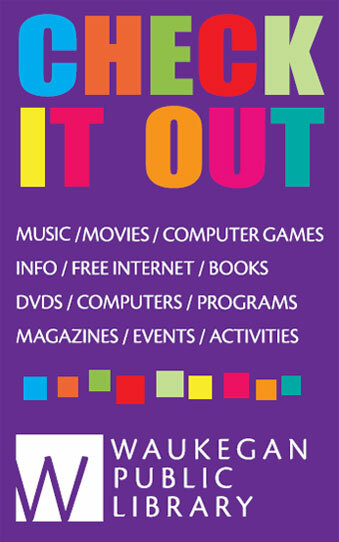 Waukegan Public Library offers many convenient services. Click the services below to learn more. If you have any questions, please contact the Reference Desk at (847) 623-2041 ext. 238. Learn the lengths of loan periods and fines per day for different items and how to renew items that are checked out to you. Individuals and not-for-profit organizations may reserve one of our main floor Study Rooms, accommodating between 4 – 8 people, and our Ray Bradbury Room, which seats 90. There is a charge for both printing and faxing. You can print your work at the Library for 20¢ for each black and white page and $1 each page for color. You may send domestic and international faxes using a credit or debit card only. The Library is unable to receive faxes on your behalf. You can use the Library’s scan station for free. Click above to learn more about printing, faxing, and scanning your documents at the Library. If you want to borrow an item that is already checked out or that the Waukegan Public Library doesn’t own, the Library can borrow it from another library through LINKin. You can access LINKin through the online catalog. The Library’s Home Delivery service provides library materials to Waukegan residents who are unable to visit the library due to temporary or long-term physical illness or disability. From free Bus to Us field trips to kindergarten book bags delivered to your classroom to borrowing privileges for District 60 teachers who live out of state, the Library is committed to helping teachers foster the love of reading in their students. Visit the Library, then visit an area museum for free! Quantities of passes are limited and given on a first-come, first-served basis. The Library offers free Notary Service and Voter Registration. During tax season, you can pick up most federal and Illinois tax forms at the tax station near the Reference Desk. Click above for more information about each service. One of the most valuable services the Waukegan Public Library offers is the privilege of checking out books, DVDs, CDs, audiobooks, magazines, eBooks, puzzles and video games. Click here to learn more about signing up for a library card. Click here to learn more about circulation periods and renewals.